A type of sweet syrup that originated on the Caribbean island of Grenada. It is made from pomegranates and is used as a flavoring and coloring for desserts and cocktails. 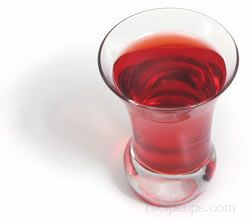 Most grenadine sold in the United States is made from substitute ingredients such as sugar syrup, fruit flavors, and food coloring and may also contain some alcohol because of its popularity as an additive for alcoholic beverages.